Theresa May has told the BBC that MPs will have a choice between her proposed address the EU – or no batch at all. She was also critical of a schedule by Brexiteers solve the Irish border issue, saying it would create a “hard border 20 km inside Ireland”. Ex-foreign secretary Boris Johnson said attempts to resolve the issue so far were a “constitutional abomination”. And Brexiteer Jacob Rees-Mogg said the prime minister should “try a bit harder” to get a better deal. 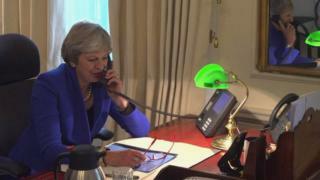 The UK is set to leave the EU on 29 March 2019, and negotiations between the two sides are still taking place. Mrs May set off her the proposals put forward by the key issue of cross-border sell after a Chequers summit in July, but it has been furiously criticized by some Brexiteers who say plans for a “common rulebook” on goods would compromise the UK’s sovereignty.